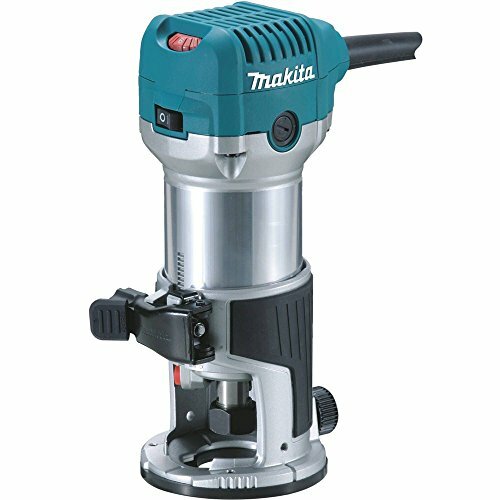 The Makita RT0701C is a hand operated compact router. Designed to be simple to use, extra kits are available to allow it to perform more advanced tasks, as well as being quite capable as a standalone product. This well priced router will have you chamfering edges in no time. This Palm Sander is designed to take standard ¼” shank router bits, but an optional 3/8” collet can also be purchased. The top of the router has a flat, durable design which allows you to rest it upside down while changing bits. In addition to this the tool has a shaft lock which makes changing bits quick and easy. If you want to adjust the depth of the bit, you can either use a quick release cam lock system for large adjustments, otherwise there is also a smooth rack and pinion system which allows for fine depth adjustment. Depth can be quickly read off the depth scales. When purchasing just the RT0701C, no dust removal option is provided but an optional dust port can be attached, and if purchasing the RT0701CX3 kit, the dust port is included. Power for the device is provided by a 1.25 HP motor, and it runs off 120V standard, drawing up to 6.5A. A large switch mounted at the front of the router turns the device on and off, with a speed control dial allowing one to operate the router at speeds from 10,000 – 30,000 RPM, whatever is needed for your application. An electronic speed control ensures you’re always operating at the right speed, even as you increase load, and a soft start feature prevents sudden jerks to the tool. At almost 8” high, the device is easy to handle, and weighs only 3.9 lbs. The design is slim, and has ergonomic features for increased comfort and control. The base of the unit is designed to provide maximum visibility which helps prevent accidents and improves performance. It further features a non-marring, high-durability surface that supports industry standard template guides. The quick release cam lock allows for the base to be switched out easily. The stock packet includes a straight guide and spanner wrench, with the router being double insulated with a heavy-duty aluminum motor housing improving durability. If you choose to upgrade to the RT0701CX7 you’re additionally provided with a plunge base, providing 3 preset depth stops and a range from 0” – 1-3/8”. If you choose to go the full mile, the RT0701CX3 includes the aforementioned vacuum port and plunge base as well as a tilt base allowing for 30 to 45 degree angles and an offset base for those hard to reach corners. 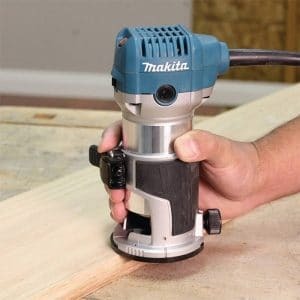 Like the Makita 9403, the RT0701C is well-made. It is a strong, well-priced router tool that any hobbyist or DIY enthusiast should have in their toolbox. The base kit offers ample performance, expandable through optional parts. Customers are overwhelmingly impressed with the tool, especially its build quality and power. It is comfortable to use, without too much vibration being sent to the operator’s hands.